Turkish-Kurdish singer Rojin: "I don’t want to be treated like a criminal"
Odak Onyango: "Theatre makes people more assertive"
Curaçao singer Oswin Chin Behilia: "We will be placed under administrative supervision"
Muhanad Rasheed: "I am Iraqi, but I still struggle with what this means"
Culture for Development is one of the new portals on the KIT website. 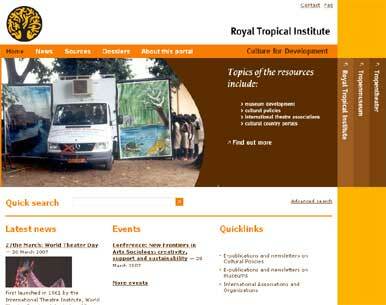 This English portal gives access to a wide variety of documents, newsletters, electronic magazines, discussion groups and other internet sources in the area of culture in or related to developing countries. It also offers news and a calendar of events. All of the documents can be completely searched. The portal is currently limited to sources pertaining to museums, theater and cultural policy, but also does its best to be complete. Files provide background information on special topics.